Clearly people serve lardo on toast in ways other than what I described. My way is merely the best way, not the only way. When I used the word "must" in my post, I meant only if one wants to serve something I will like. I'm with Kenny on this one. 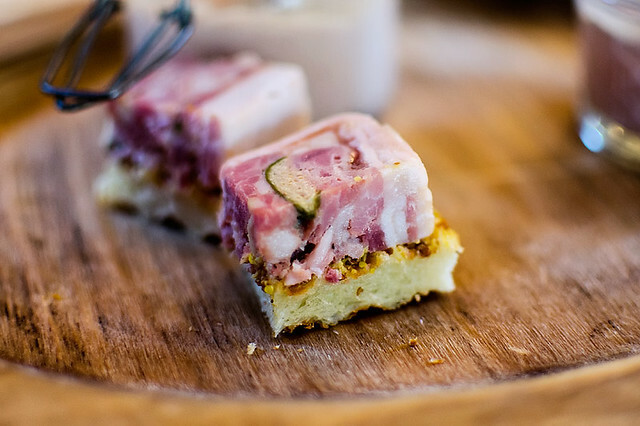 When it comes to lardo, more is not always better. jesteinf wrote: I'm with Kenny on this one. When it comes to lardo, more is not always better. No one is arguing that more is better with lardo or anything else. If I had a 1.5 inch smear of lardo on the toast I had at OTS, I probably wouldn't have enjoyed it as much either. But, the lardo I had was a thin smear, fully melted in a way that is almost never the case with slices of lardo (unless you have a very sharp slicing device and can get it just a few nano-particles thick). My experience has been that at deli counters, it's very hard to get the slicer to slice a piece of lardo so thin that it will melt on contact with even very hot bread. 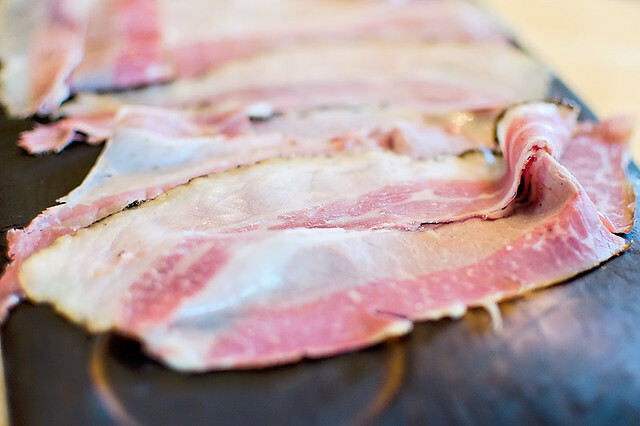 That's why, in MikeG's picture above, the lardo is sweating but has a long way to go before it melts. 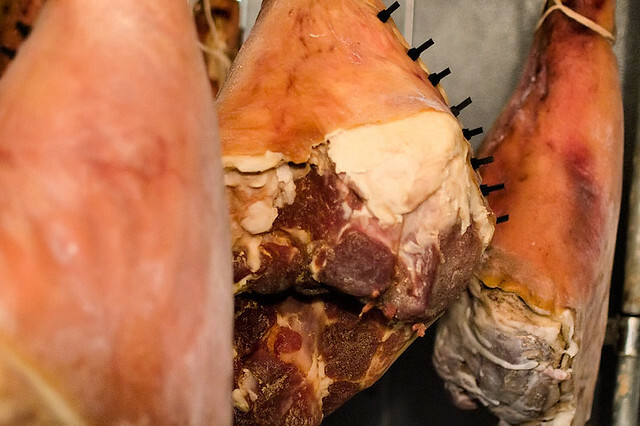 It would pretty much have to be placed directly under a broiler to get that dense kind of fat to melt (and even then, with slices like that, it'd probably burn the bread before it melted the lardo). I agree that deli slicers can't do this right. I always slice my lardo by hand with a super-sharp, super-thin knife. Paper thin. Maybe thinner. That's the way it must be done. Next time you slice lardo thin enough to melt on contact with warm bread, I'd love to see the pic. 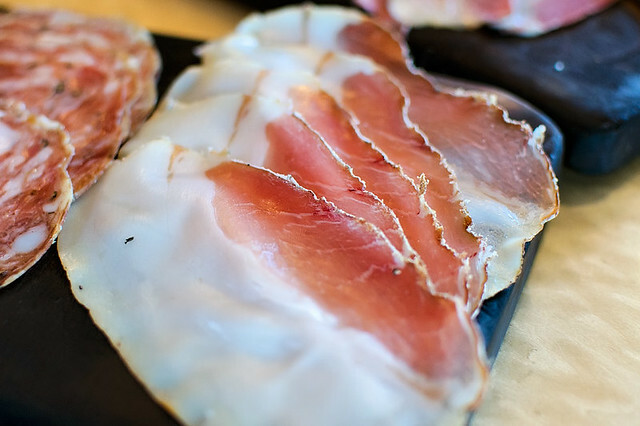 David Hammond wrote: Next time you slice lardo thin enough to melt on contact with warm bread, I'd love to see the pic. G Wiv wrote: On Wednesday 9pm last week there was only one other person eating in the entire bar/restaurant, scattered drinkers, a few couples canoodling around the fire place, but as the charcuterie at Old Town Social is in the top tier of a city that loves its meat it really should be busier food wise than one fellow slurping pasta and me making time with the salami. 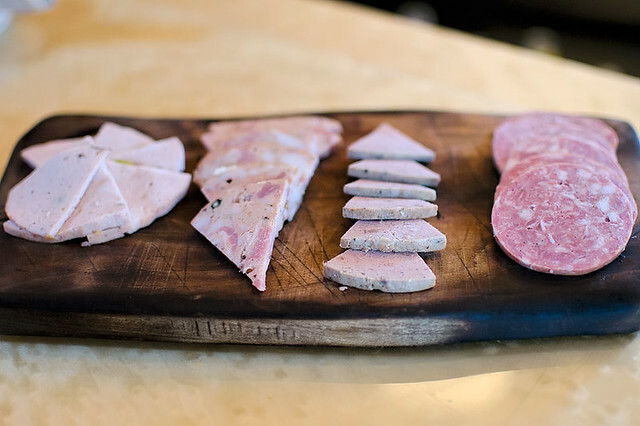 I worry for the charcuterie program at Old Town Social, Friday 8pm, full bar, party in the upper dining deck, hand-holding around the fireplace and people eating on the outside patio, few of which had charcuterie. My wife says it because their customers are diet conscious, maybe so. 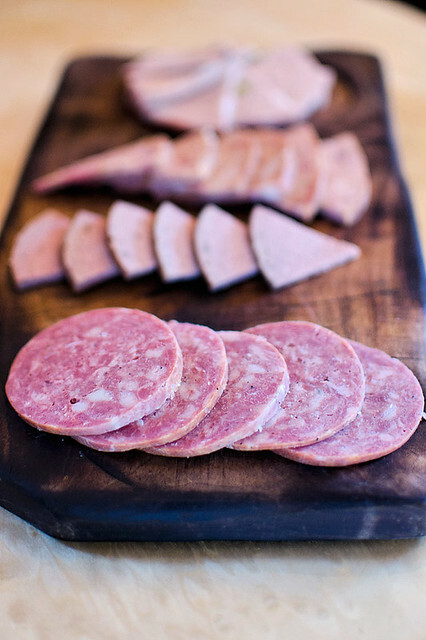 I think OTS should start by educating the customer, have the waitress/bartenders emphasize the house-cure aspect, if 30 +_- customers are clamoring for pig face at Girl and the Goat there is no reason OTS shouldn't be slinging em salami. G Wiv wrote: I think OTS should start by educating the customer, have the waitress/bartenders emphasize the house-cure aspect, if 30 +_- customers are clamoring for pig face at Girl and the Goat there is no reason OTS shouldn't be slinging em salami. Girl and the Goat came with sort of a built in "foodie" audience (they also managed their pre-opening hype extremely well). I don't know of anyone outside of this forum that thinks of OTS as anything other than a bar. 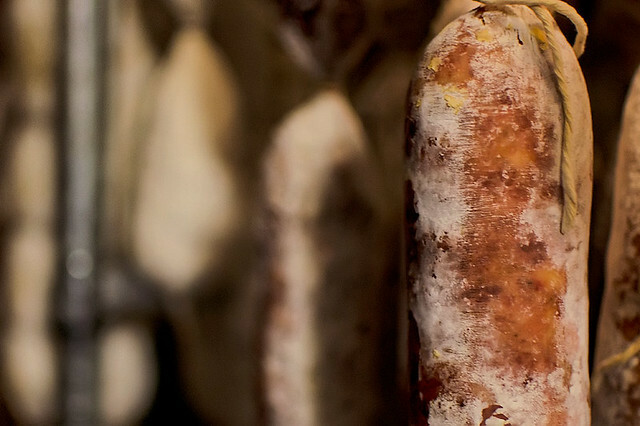 If they want to be thought of as a destination for charcuterie, they really need to market themselves better. jesteinf wrote: Girl and the Goat came with sort of a built in "foodie" audience (they also managed their pre-opening hype extremely well). I don't know of anyone outside of this forum that thinks of OTS as anything other than a bar. 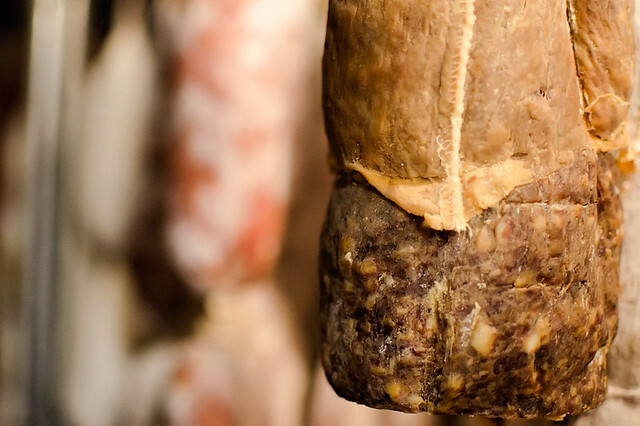 If they want to be thought of as a destination for charcuterie, they really need to market themselves better. Having dined in at OTS for the first time last week--i had done carry-out the previous two times--all I can muster is that this may be the most absurd vanity project in the Chicago restaurant scene: you've got these chefs, all that kitchen space, all the effort put in to curing, and a room perfectly fit for the gastropub/haute barnyard craze, and yet absolutely no one is the wiser about it; in fact, the people around us, if they ordered food, were picking corn dogs and burgers. At what point, as Gwiv suggests, do they abandon it all for chicken nachos? Or is this place just that nonsensical that they'll keep a menu that is 90% unordered? No matter: the charcuterie, as GWiv was saying, is still on. The lardo is laid on thick, but they're tossing in extra crostini now; rub the excess spread on the extra crostini and you're golden--best fat-on-toast in town. 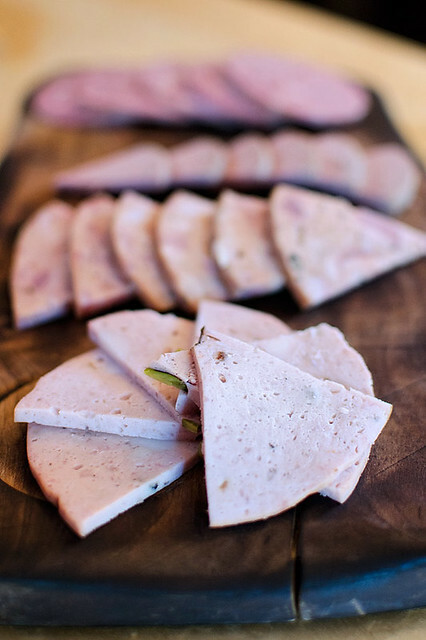 The salumi--particularly the lamb salami, chorizo, coppa, mortadella--have been faultless; I particularly like the chicken liver mousse and pate, both of which outshine the rillette. Salads here are more Avec-like than you'd expect: my gf and I had a deconstructed panzanella salad that, while a little overdressed, had a nice melange of late-harvest yellow and red tomatoes, shards of parmesan, and crispy chunks of bread. A bourbon gelato, if really lacking the creaminess necessary to be a gelato, had the kind of flavor unveiling you'd expect from a dish at molecular gastronomy, with hints of spice and smoke giving way to a favorable maltiness that teases and lingers. An unexpected pleasure. And that's how I see OTS, even if it doesn't want me to. 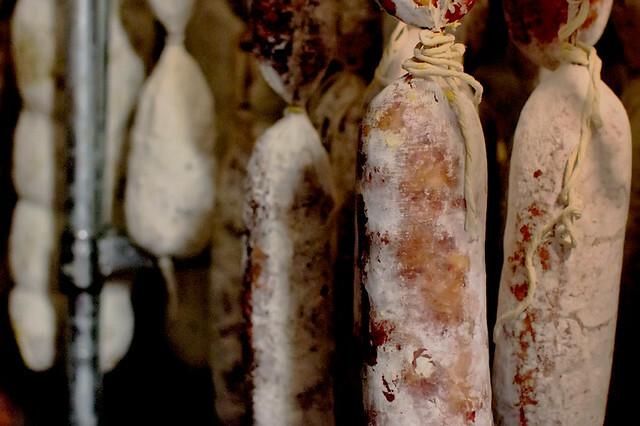 A plea: serve the d-bags; keep the charcuterie. 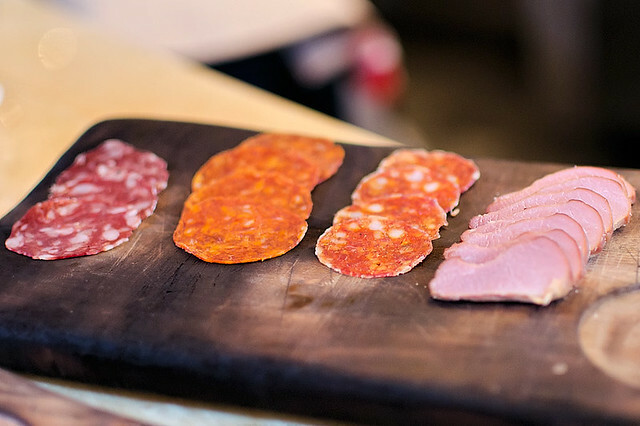 If I had to guess the charcuterie is a hobby, and from what's above maybe a passion, of the chefs at Old Town Social. 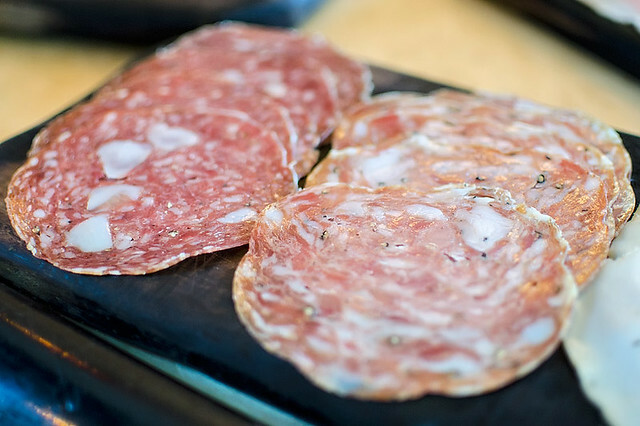 Charcuterie is probably a relatively inexpensive hobby for a chef. Said bar/restaurant is making hand over fist with people drinking Miller Lite and slamming shots of Patron (because they're classy). Your chef wants to play around, while throwing out burgers by the dozen, you probably let it go. In conclusion, let's hope the charcuterie sticks around because I still haven't been there (even with friends who live at the end of the block). A good article, but I hope people reading it don't go to OTS expecting the kind of ambience usually associated with "Old World craftsmanship and artisanal pasture-raised meats from local farmers." 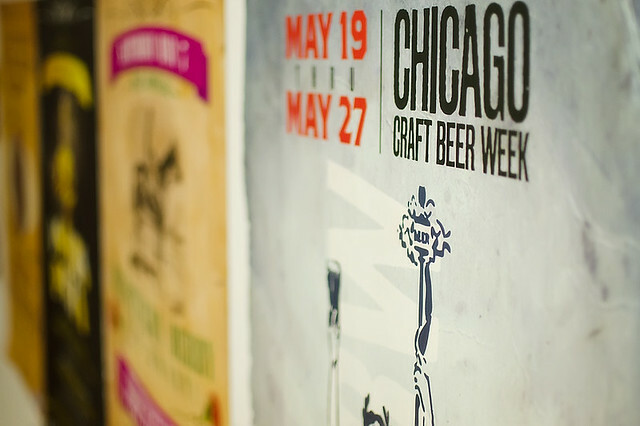 Clearly one of the more schizophrenic venues in Chicago (the house and the kitchen -- or at least what comes out of it -- seem to be coming from different dimensions). This is not meant to be a pan against the charcuterie, which is terrific (also the mussels are worth a try as is the mac/cheese if you like it fairly standard and creamy). But if you go on a football Saturday, wear Big-Ten colors if you want to fit in. I grabbed some drinks and food at OTS last Thursday. Was meeting a friend to talk and I also wanted to be able to watch the Bears game, so he suggested OTS, noting that they have tons of TV's there. I was wary of heading to such a popular mainstream destination on the night of a Bears game, thinking it'd be packed and crazy. And it was, but that didn't really pose a problem. The place is just so massive that there was still plenty of room for me to get a drink, circulate, watch the game, and then once my friend arrived, we we showed to a table near the fireplace fairly quickly. Food was excellent. We had a charcuterie platter that I was quite impressed with. The seasoning is very restrained and that allows the subtleties of the locally-raised meat and the curing/smoking/fermenting process to shine through. Also had the sausage and waffle, on my friend's recommendation, and loved it. I'm always a sucker for a good, freshly-made waffle, especially when it's got bacon bits baked into it, but the massive Polish-style sausage that was perched on top, neatly sliced into four fat juice-oozing chunks--one for each waffle quarter, was perhaps the best Polish sausage I've ever eaten. Loved it. Great cocktail list, great beer selection, great charcuterie, and a nice-looking menu full of upscale bar food. The main knock against this place appears to be the pedigree of the diners who go there. Which I find strange. I very much enjoyed it and will definitely go back. Made the mistake of going to OTS for dinner at 9pm on a Friday night, and had some extreme love/hate feelings about the experience. I thought the cheeses, "bar snacks" (pickles, nuts, and whatnot), and charcuterie were almost all excellent...the one that my wife didn't like at all, and that I wasn't super crazy about, was the potted rillettes. We both loved the duck rillettes at the Publican, and the pork rillettes at gone-but-not-forgotten, original Mado (RIP), and held OTS's duck/pork/cognac rillettes up to the same bar...but it felt like it was missing something in both the texture and flavor departments in comparison. There was a ton of it though. I was slightly annoyed by the fact that when we asked if we could order the $16 "collection of five" charcuterie items, and asked if we could choose which five items we wanted, we were told "sure! "...but when our bill arrived, we found that we'd been charged for five items at $4 apiece. We should have been told that the "collections" are chef's choice, and that in order to specify which items we wanted, we would have to order a la carte. Not a big deal though, now I know for next time. The mussels were great, as mentioned by others, and the side of grilled bread was quite generous. Unfortunately, I thought the atmosphere was just awful. We were seated in one of those alcove tables in the main room, which was cool when we first got there and the obnoxious crowds were confined to the general vicinity of the bar. As the night wore on, the crowds grew and filled the entire room, until I felt like we were eating dinner in the middle of the Bull & Bear. Our little table was surrounded by two groups of tanked young women shouting to be heard over the music, dropping drinks, and taking arms-length pics of each other on one side, and a large group of guys (all wearing the same uniform of jeans, blue Oxford shirt, and navy blue blazer) high-fiving and attempting to woo all passing ladies with their bottle of bargain-priced prosecco on the other. We had initially hoped to stay there to enjoy a couple of leisurely pints after dinner, but we scrapped that plan and got the hell out of there. I think I need to go back to Old Town Social on an off day, at an off time. My question is how could anyone of you stand to be in that place. It took the waitress about twenty minutes and took about half an hour to get our food. The food was OK nothing to write home about I have had much better in other places. The problem is you could not event hear the person across from you at the table. Not only were the tv's all on with three different games playing but on top of that you had loud obnoxious music playing to drown out the game. How can anyone enjoy the food if it is that loud is beyond me. For me it is thumbs down I could not even enjoy the food I ordered. Too bad for this place, none of the guests I brought with me liked it either, I would say since I recommended the place, based on the great reviews on LTH, that the guests were super mad at me since the place was so obnoxious to be at. Too bad they cannot have a quiet dining room where you can enjoy the food and company you bring with. By reading this thread and learning what to expect, then planning accordingly. Cookie Monster wrote: My question is how could anyone of you stand to be in that place. It took the waitress about twenty minutes and took about half an hour to get our food. The food was OK nothing to write home about I have had much better in other places. The problem is you could not event hear the person across from you at the table. Not only were the tv's all on with three different games playing but on top of that you had loud obnoxious music playing to drown out the game. How can anyone enjoy the food if it is that loud is beyond me. For me it is thumbs down I could not even enjoy the food I ordered. Too bad for this place, none of the guests I brought with me liked it either, I would say since I recommended the place, based on the great reviews on LTH, that the guests were super mad at me since the place was so obnoxious to be at. Too bad they cannot have a quiet dining room where you can enjoy the food and company you bring with. You can also go at an off time. I had an early dinner at the bar one night and missed out on the obnoxiousness. it was quite busy when I ate there last week (thursday, Bears game, 9-10:30pm), but the table at which we were seated was fairly secluded and it was no problem whatsoever carrying on a conversation. I'm thinking that folks who want to avoid the loud bar crowd could probably ask the hostess to seat them with that in mind. I finally stopped in at OTS for the first time last week, after attending an event in the neighborhood. A couple of my previous attempts to visit OTS were aborted due to circumstances beyond my control. In any event, I was very pleased with the food we ate, which was off their limited, late-night menu. We tried 6 charcuterie items: coppa, finnochiona, mortadella, pastrami, potted rillette and lardo. I thought all the items were very good to excellent. I was especially impressed with the finnochiona, which delivered a noticeable but not overwhelming perfume of fennel seed. The definition was textbook and I loved the big chunks of luscious fat throughout the slices. The coppa was also outstanding. It was made from a beautifully well-marbled muscle and had a great earthy pork note. It was tender and unctuous, too. My least favorite of the items, the mortadella, was still very good flavor-wise but was a little gritty/crumbly on the finish. Other snacks we ordered included market pickles, smoked almonds, spicy chickpeas and house-marinated olives. I loved the chickpeas. They were spicy, really crispy and very enjoyable. I also really enjoyed the pickles, especially some little cubes of pickled melon, which combined sensationally with the supremely rich rillette. To drink, I started with a cocktail called the Modern, which I thought was just way too sweet. It kind of reminded me of spiked lemonade. I realized almost immediately that I'd erred, bypassed finishing it, and decided that I wanted a tripel, instead. Our server, Janice, who was friendly and efficient, recommended the Tripel Karmeliet, enthusiastically noting that it was her favorite beer on the the menu. It was perfection, especially when paired with what we were eating. My only quibbles were that my water glass was kind of gross and felt like it had food stuck to the outside of it and the men's room was pretty trashed...very minor things in the grand scheme of things. But I'll definitely be back. I'm eager to try more of their food, which is really some exciting stuff. ronnie_suburban wrote: I was especially impressed with the finnochiona, which delivered a noticeable but not overwhelming perfume of fennel seed. The definition was textbook and I loved the big chunks of luscious fat throughout the slices. If I had to die of salt, Old Town Social would be a delicious place to do it. Their reasonable, homemade bar snacks and charcuterie are the right foil for an ideal beer list (Third Coast Old Ale, please). Their finnochiona rocks; it also comes with a generous portion of delicious grilled baguette with good butter or oil, and at the right times of night a complimentary mostarda. However, the olives, deviled eggs, and pickles are all worth picking up. I posted recently about the cornmeal-bacon waffle and house-smoked thick-cut sausage, and it approaches excessive with some panache. Turn the music down and do a better job with the glassware (mine was clean, but streaky and still hot), and I'd haunt the place. Recently, I volunteered to plan a dinner for a grad school reunion for about 25 guests. Several attendees expressed concern over cost, and dinner had to be a short cab ride from the Museum of Contemporary Art. We decided on OTS and I have to say that the staff did an outstanding job, even on a busy Friday night. Even with a few dozen of us crammed into a relatively small space with folks moving around mingling, the staff managed to keep our checks separate (something they volunteered to do) and made sure the right food and drinks got to the right people. Rich and I only tried a handful of dishes, but everything we tried, including the pork belly reuben and a charcuterie platter, reminded me of just how seriously OTS takes its elevated bar food. I'd strongly recommend OTS for parties and would happily use them again. Full disclosure: I do a tiny amount of business with OTS. I don't know if it's been mentioned in this thread, but OTS has 23 televisions, all of which can be raised to completely disappear from the dining room during brunch, dinner service, maybe during other non-game times. If the TVs are a concern, it might be worth calling to check if they're up or down. I've actually never been there and seen the TVs, but Sous Chef Ray explained this all to me. 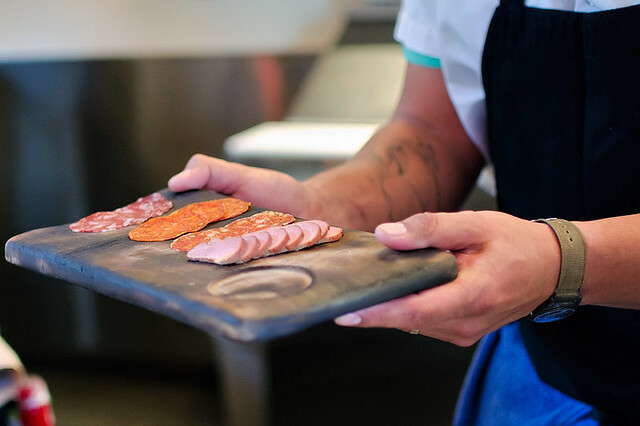 I asked Sous Chef Ray yesterday how charcuterie business is doing, and he said very well, particularly as the weather is warming up (kind of). He said people are looking for "lighter" foods and choosing the cured meats. 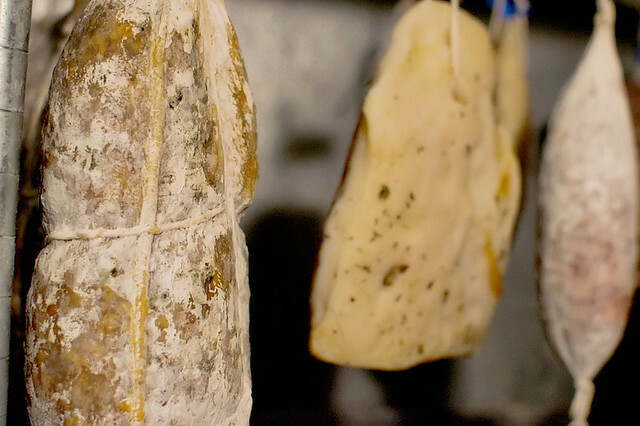 The charcuterie program is as robust as ever, with customers even ordering by the pound for pick-up. They got a new pig in on Friday, and I got to see some of the breakdown and visit that dreamy curing room again--like heaven every time. There will be some staff changes in fall/winter with Ray moving over to their new Italian restaurant in the old Marché space. 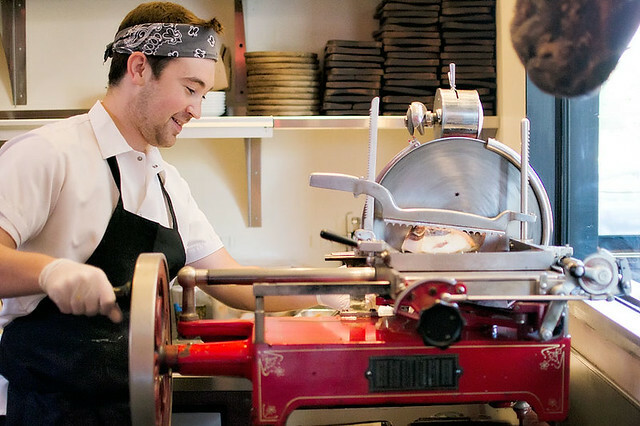 For the charcuterie program at least, it sounds like they've built a pipeline of guys who can continue the good work at OTS, even as they add restaurants. FWIW, OTS' hand crank Berkel has been fixed and is working well again. Yes! Finally a decent spot for al fresco dining in the neighborhood. Last summer I went and shouted at our dining companions all evening. Now, I sit outside and enjoy the warmer weather, decent service and good seasonal offerings-- even for a vegetarian. I've been the last 2 weekends and as soon as it warms up, I'll want to go back. Against my better judgement, today I took part in Hellodali and happy_stomach's biking and eating adventure, Fork and the Road. Our last stop of the day was Old Town Social - highlighting their charcuterie. Color me impressed. Though OTS had been on my radar for a while, I had not been there before today. Now I am eager to get back. Was pretty sweet to have an inside look as to how they prepare their cured meats. happy_stomach and I spoke about how misconceiving OTS can be from the outside, and I agree. Old Town Social screams Buffalo Wild Wings both from the outside, and the first glance when you step in. My hope is that serious food enthusiasts are able to look past that and enjoy a fantastic meal. Nice post, incite. I'm a huge fan of their charcuterie but have never loved much else about OTS. I love your shots, especially this one . . .
. . . what the heck is that delectable morsel? ronnie_suburban wrote: . . . what the heck is that delectable morsel? Err...I'm hoping happy_stomach can chime in here. Everything was sort of brought out at once, and while all were delicious, I did not catch specifics on that cut in particular. Once I get that information, I'll edit this accordingly. incite wrote: Err...I'm hoping happy_stomach can chime in here. Everything was sort of brought out at once, and while all were delicious, I did not catch specifics on that cut in particular. Once I get that information, I'll edit this accordingly. I'm quoting the photo again just because it's such an awesome shot. I believe that bite was their country pate on buttered toast. They do, indeed, spoil us at OTS. As I tell our riders, tour after tour, I never tire of learning and re-learning about the OTS charcuterie program. Some seriously passionate and committed dudes over there working with ever exacting standards...phenomenal. I live around the corner from OTS. I love their food. I've never had anything from there that wasn't outstanding. Plus they have an excellent beer list. Going after 9 PM on a weekend night is where I draw the line. Night and day between a weeknight and weekend night.